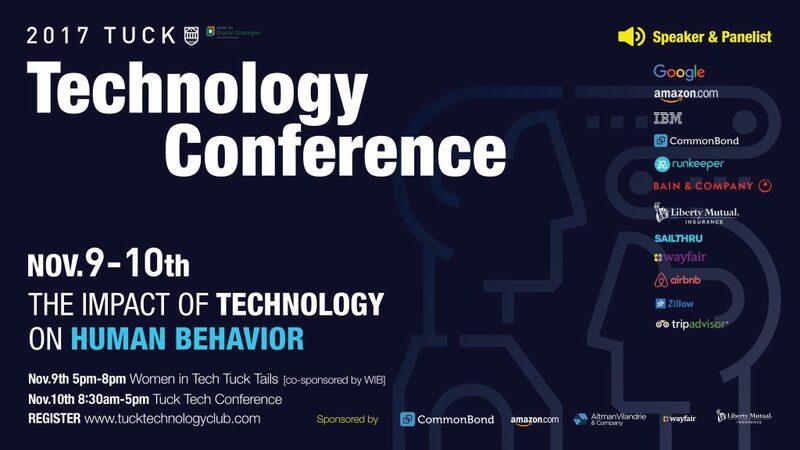 The 2017 Tuck Technology Conference, titled “The Impact of Technology on Human Behavior” will take place on Friday, November 10, 2017. The conference will dive into the technologies that set new norms for human lives and its implications to the world of business. The Tuck Tech Conference is one of the largest student-run events hosted by Tuck. Every year, we invite the Tuck student body, broader Dartmouth community, and business leaders from around the world to explore the tech industry’s innovations, business practices and leadership methodologies. We believe engaging with industry leaders will bring our MBA student body and all conference participants one step closer to the Tuck vision of educating wise leaders to better the world of business. CDS runs or supports conferences, seminars, and other student-facing events designed to complement our student programs. The goal of these programs is to connect MBAs with thought leaders, business executives, and alumni with experience and knowledge of digital technologies which are relevant to the center’s areas of expertise. We regularly partner with student organizations, the Career Development Office, alumni services, and Tuck faculty to enable these events and to ensure a rich learning experience for students.